Big themes and a big orchestra filled Palo Alto’s Lucie Stern Theater last Friday, Feb. 16 for the opening of Beethoven’s Fidelio. It was his only opera and he cursed the ten years that he spent writing and revising it. Although Beethoven was the Grand Master of many musical forms from symphonic to sonata, his one attempt at opera was cautiously received in 1804 and then again in 1814 and still performed less than one might expect from the stirring music and clever ensembles. That fault may lie in the earnest libretto, which was neither comic nor tragic, but rather moralistic and carefully political. And like a lot of political art that needs to get past the censers, there was a choppy quality as if had been heavily cut, and an overall tone that could only be described as blandly optimistic. While Beethoven was inspired by the turmoil of his era and the long French struggle for freedom, he didn’t want to alienate the two powers of the land – the Church and the Aristocracy. So the cast had to frequently trumpet their faith in God, and the savior of the political prisoners was…ahem… the Attorney General. On top of walking that rather narrow path, Beethoven was part of the early movement away from Classical (which was already brand new) and into Romantic, with idealizations of Liberty and Justice and Beauty cropping up all over the arts. Combined with the grandeur of his middle or “heroic” period, those ideals tended to flatten Fidelio’s characters into cartoons. But the music did shine a path through that marsh, especially in the overtures where one could clearly hear the mastery. Here were intimate passages and woodsy winds, noble horns and stirring progressions, all woven together into a tapestry that built into big and satisfying moments that shook the hall. Kate Fruchterman, Ben Brady and Meredith Mecum in Fidelio; photo by Otak Jump. José Luis Moscovich led the larger-than-usual orchestra with economy and attention. That small pit in the Lucie Stern Theater was enlarged by placing the horns and winds in two-tiered constructions on each side of the stage, where they could still see the conductor. It is an arrangement that allows West Bay Opera to host a fuller orchestration instead of the careful reductions of many of their productions. Clever staging by Ragnar Conde made the most of an excellent set by Peter Crompton and projections by Frederic Boulay, turning the original ancient French dungeon into a modern high-security prison with sturdy lines and heavy concrete forms. And the singing was classy. 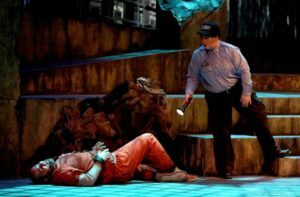 Ben Brady brought warm bass heft to his role as the chief jailor throughout the opera, embracing the emotional center of the action as his role slowly grew from the narrow strictures of a soldier into a moral awakening as a citizen. Leonore was sung by New York-trained Meredith Mecum, a lyric soprano with a lovely mid-range and purring low notes. Her big sound was driven by a heavy vibrato and would be better suited for Verdi or Wagner than for duets and ensembles, of which there were many in this production. But her duets with Kate Fruchterman, who sang the delicate and enchanting soprano role of Marzelline, daughter of the chief guard, had something more. Leonore was disguised as a man to infiltrate the jail and search for her husband, Florestan, and when Marzelline falls in love with her there was some real chemistry onstage. Actually, I thought they would be better off together! Brent Turner and Meredith Mecum at West Bay Opera; photo by Otak Jump. And particularly appealing was the men’s chorus, which quick-changed from guards to miserable wretches as needed. Prepared by chorus master Bruce Olstad, they had a firm smooth sound further emboldened by Beethoven’s careful bracketing of bassoons and oboe. 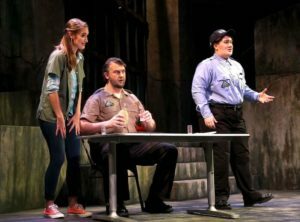 The cast was amply filled out by Bay Area regulars Carmello Tringali as the spurned tenor, Krassen Karagiozov as the baritone everyone loves to hate, and Kiril Havezov, the velvet-toned Attorney General. This production will be repeated on Saturday, Feb. 24 at 8:00 p.m. and Sunday, Feb. 25 at 2:00 p.m. at the Lucie Stern Theater, 1305 Middlefield Road, Palo Alto. See westbayopera.org for more information and tickets. Photo, top, of Kate Fruchterman, Ben Brady and Meredith Mecum; and below, Brent Turner and Meredith Mecum. Both photos by Otak Jump.